"Jumbo shells surrounded by marinara sauce, and stuffed with green peppers, mushrooms, onions, and shredded cheese, topped with mini pepperoni and baked." Place crushed tomatoes, canola oil, oregano, basil, and sugar into a large saucepan, cover, and bring to a boil. Reduce heat to a simmer, and cook the sauce, stirring frequently, until the flavors have blended, about 30 minutes. Fill a large pot with lightly salted water, and bring to a rolling boil. Stir in the shell pasta, and return to a boil. Cook the pasta uncovered, stirring occasionally, until the shells are cooked but still firm, about 10 minutes. Drain thoroughly. Mix the mushrooms, green pepper, and onion in a bowl. To stuff the shells, spoon about 1 teaspoon of tomato sauce into a shell; sprinkle with the mushroom, green pepper, and onion mixture. Top the shell with about 1 tablespoon of Monterey Jack cheese. Repeat for remaining shells and filling, and place the stuffed shells into a 9x13-inch baking dish side by side and touching. Place several slices of mini pepperoni on each shell. Pour the remaining tomato sauce gently around the shells. 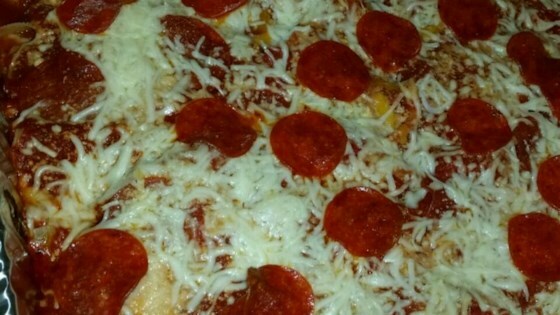 Bake in the preheated oven until the cheese is melted and browned and the pepperoni slices are crisp, about 30 minutes. Try it with the onions lightly caramelized. Goes very good with the cheese. Very good, I did not add the sugar however. Beautifully easy to make; my husband fell in love with these :).